On June 28, 2011 Sericore Technologies was awarded a SeaPort-e Indefinite Delivery Indefinite Quantity (IDIQ) contract administered by the Naval Sea Systems Command (NAVSEA). 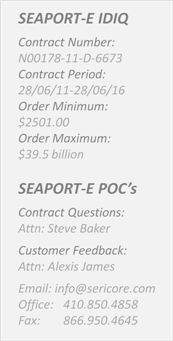 For information on how to obtain goods and/or services from Sericore via a SeaPort-e contract, please visit the SeaPort Acquisition Portal at http://www.seaport.navy.mil/. However, Sericore has other contract vehicles in place to provide support to other Department of Defense (DoD) organizations. –	Veteran and Service-disabled veteran owned small businesses (VOSB, SDVOSB). –	Women-Owned small businesses (WOSB). –	HUBZone and 8(a) certified small businesses. Sericore’s quality assurance (QA) processes will vary according to the customer’s needs. As such, a more detailed Quality Assurance Plan will be developed for each SeaPort-e task order received. SeaPort-e is an ID/IQ contract vehicle. Task orders are competed and executed as separate procurements and are listed below.